It’s the weekend before Halloween, and it’s a very busy weekend in central Indiana. Local comic shops are giving away free comic books, there’s a festival in Irvington, and then there’s what’s become my yearly tradition, Doctoberfest! 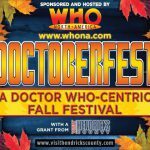 Doctoberfest is a fall festival with a Doctor Who theme. It’s held in Camby, and this is the third year it’s been going. 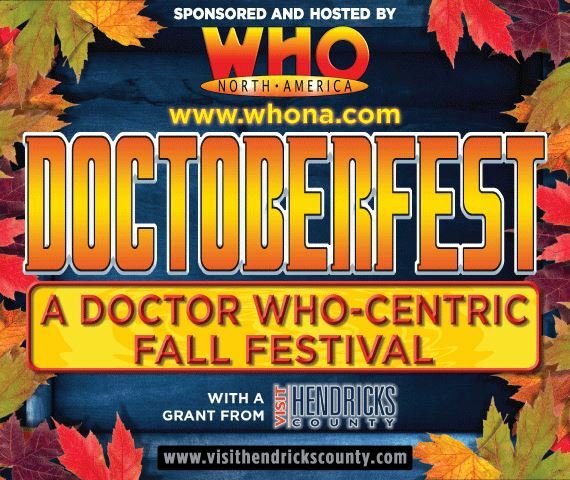 Running tomorrow, Saturday the 27th, from 11:00 AM to 6:00 PM, this event will not only be held at Who North America, THE stop for Doctor Who fans in the midwest, but also will feature vendors selling their wares, many of which are hand crafted and Doctor Who related. In addition, there will be the Twisted Sicilian food truck for food, a collection for Toys for Tots, costume contests, pumpkin carving and painting, carnival games, and more! In fact, there’s not just THAT, but there will also be a balloon artist creating a Tardis, and Russell McGee (author, audio engineer for Big Finish Productions) will be signing autographs! Finally, if you aren’t excited enough, Rachel from the Five-ish Fangirls and I will be splitting a booth, talking about what we do, interviewing people, and selling blog merchandise. I know I’ll have everything I normally do on hand, though I’m almost out of fidget spinners, and I’ll have a donation box out for, well, myself. So head over to Camby tomorrow, because it looks like the rain should be gone by then, and get your Doctor on! How much is it? The event is free, but some events will cost money, plus you’ll want to bring money for the vendors and food. Where can I find information? The Facebook Event Page has been the best place for up-to-date information.